“STUDIO INN Nishi Shinjuku” is an apartment type mini hotel with 5 stylish and cozy guestrooms. 3 guestrooms will be double bed type (140 cm x 200 cm) and 2 guestrooms will be twin type with 2 single beds (100 cm x 200 cm). Each guestroom will be about 25 square meters in size and will be equipped with a mini-kitchen, complimentary in-room WiFi, 32 inch flat TV with cable and satellite channels, bathroom with bathtub and “washlet toilet”(electronic toilet with bidet and seat warmer), desk and 2 chairs, refrigerator, microwave, electric kettle, Nespresso coffee maker, hairdryer, and individually controlled heat and air-conditioner. – Each guestroom will be equipped with: mini kitchen, complimentary in-room WiFi, individually controlled heater and air-conditioner, desk with 2 chairs, bathroom with bathtub, “washlet” toilet, an electronic toilet with bidet and seat warmer function. The guestrooms will thus be suitable for both short-term and long-term stays. – Guestroom facilities/amenities: 32 inch flat TV with cable channels, refrigerator, microwave, Nespresso coffee maker, electric kettle, hairdryer, face and bath towels, shampoo, conditioner, body soap, hand soap, toothbrush set, and slippers. – Check in time is 3:00 pm to 11:00 pm and check out time is 11:00 am. – Laundry room with 4 laundry washing and drying machines is located in the building and guests are welcome to use them anytime. – We can call/arrange taxi for the guests when necessary. 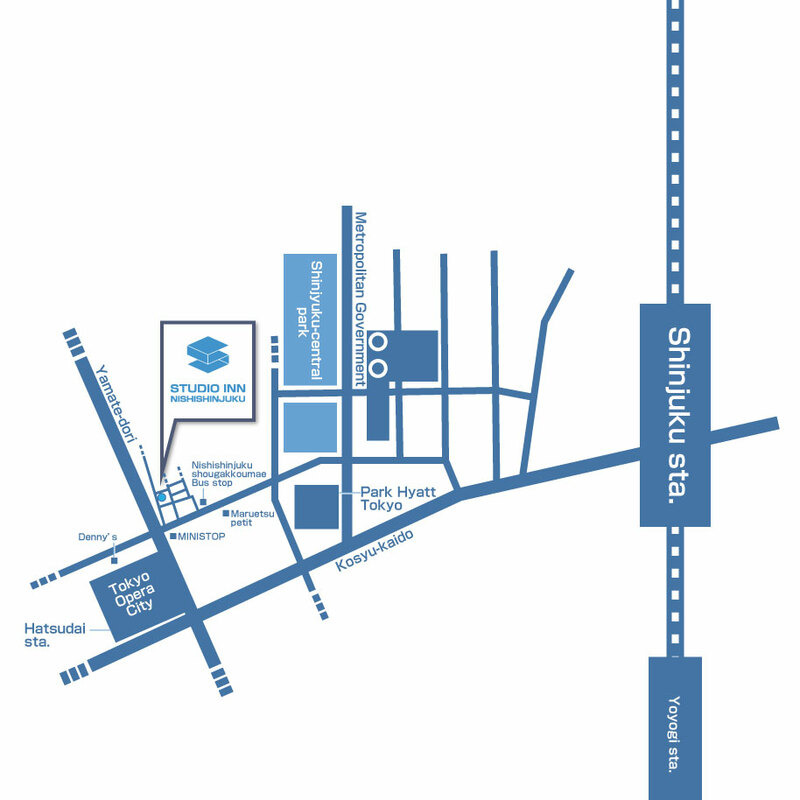 STUDIO INN Nishi Shinjuku is only 400 meters(direct distance) from Park Hyatt Tokyo from where you can take the airport limousine bus to and from Haneda and Narita Airports and is only 1.4 kilometers from Shinjuku Express Bus Terminal (BASUTA) from where you can take express bus throughout Japan. STUDIO INN Nishi Shinjuku is only 600 meters from Tokyo Metropolitan Government Building, a famous building in Tokyo designed by Kenzo Tange, one of the most significant architects of the 20th century. By the way, the building where Park Hyatt Tokyo is located was also designed by Kenzo Tange. Tokyo Metropolitan Government has an observatory, Tokyo Sky Guide, on the 45th floor where you can have a wonderful view of Tokyo and it is free of charge. STUDIO INN Nishi Shinjuku is only 300 meters from Shinjuku Chuo Park, which is the largest public park in Shinjuku (88,000 square meters) and is an oasis in a middle of urban town. It is divided into 7 zones: kids park, playing ponds for kids, multi-purpose sports ground, people’s forest with sakura trees, water square facing a mini Niagara Falls, lawn park, and biotope where you may be able to find various small creatures such as insects and plants according to the season. Shinjuku which is commonly referred to the area surrounding Shinjuku station is Tokyo’s largest entertainment, shopping, dining and business area and it also has abundant parks full of greens. 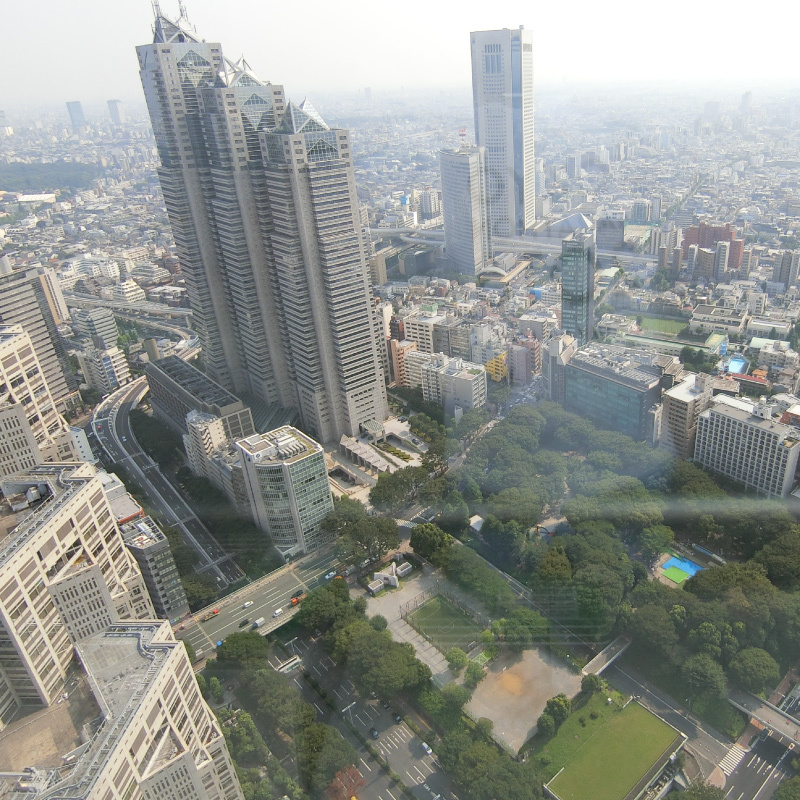 Thus, Shinjuku including Nishi Shinjuku, where there are numerous hotels, department stores, dining places and parks, is one of the most suitable places to stay for families, couples, and friends traveling in Tokyo.